Is hearing loss something you should let choose your career path for you? For that matter, is there any career that you couldn’t do with a hearing problem? More than 20 percent of the population in the United States has some form of hearing loss and many of them have jobs that you might think are impossible without a perficient hearing. You might even be surprised to learn that individuals with hearing loss are lawyers, actors, musicians, dentists, judges and, yes, even doctors. The fact is determined people who are hearing challenged find few limitations in their lives, especially given today’s advancements in hearing technology. Physicians that face this problem just look for workarounds that help them accomplish their goals. It is, after all, one small obstacle in a road full of challenges. How do physicians who have hearing loss manage their jobs? Who would know better than a doctor that hearing loss and intelligence having nothing to do with one another. Hearing impairment is simply a mechanical failure of some portion of the auditory system. It doesn’t have anything to do with cognitive thinking or problem-solving skills. Once a person with hearing loss accepts that they can stop being held back by this one sense, or lack of it. Doctors look for solutions that help them overcome any hurdles related to their ear health. 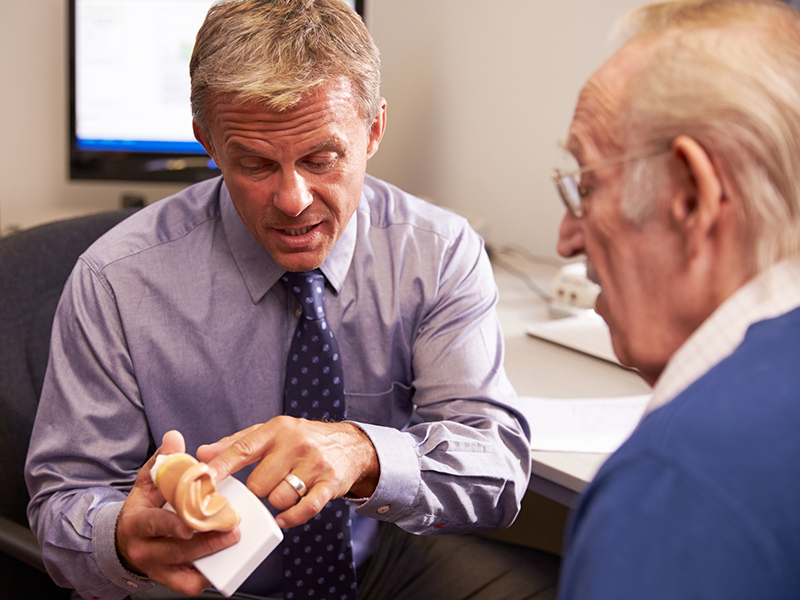 A physician experiencing gradual hearing loss will know to do what everyone else should too — see an ear specialist and get a proper diagnosis. Hearing loss can occur for many reasons and some of them are reversible. The problem may be excess ear wax, for example. Chances are a medical doctor will also know to get regular hearing tests to gauge their decline. This allows you to be proactive about your hearing health. There is no rule that says you must learn to live with hearing loss. Doctors understand the importance of hearing assistance tools like good quality digital hearing aids. After the hearing test, a physician would know to work with a certified retailer to find a brand and model hearing aid that best suits his or her needs. It’s possible a physician might do well with hearing aids that are Bluetooth compatible, for instance, and have directional microphones. Bluetooth allows the physician to connect the hearing aids to a smartphone or tablet and directional microphones enhance conversation in noisy environments. Noise reduction probably comes in handy, as well, to filter out background noise. For a physician that might include joining professional organizations to network with colleagues facing the same challenges. The Association of Medical Professionals With Hearing Losses is a practical choice for an industrious doctor. They will connect clinicians with other professionals online and via conferences, but they offer some must-have resources, too including ones that help the hearing challenged physician to find the right stethoscope. There is little doubt that hearing loss, new or a lifelong, opens up some career concerns, but, just maybe, it leads to new opportunities, as well. Consider Dr. Philip Zazove, for example. Dr. Zazove has been deaf most of his life and saw the challenges first hand. He states in an article for CNN Health that he applied to 12 separate medical schools and didn’t even get interviews despite doing well on the MCATs. After settling for graduate school, he was finally given a chance to go to medical school. Nowadays, he uses his hearing loss to help his patients facing similar problems. In his family practice, he works with many who are hard of hearing or severely deaf. His life experiences have given him a distinctive opportunity to help others find their own way through life despite the challenges they face. What do physicians with hearing loss do? The same thing anyone else does, they march on against the things that work to hold them back beginning with a proper diagnosis and hearing test.